March 24, 2013 · by Zack Reyes · Post may contain affiliate links. See my disclosure policy here. 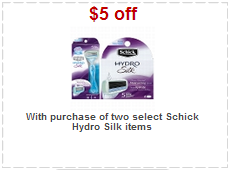 There's a new $5/2 Shcik Hdyro Silk Target coupon that makes for a potential freebies! Some Target stores have an unadvertised deal on Schicc Hydro silk products where you get a $5 Target gift card back wyb 2 products. Target has single packs for $7.99.